The enforced Millennium – no way to ignore Charlemagne! Let us suppose, the 'purging of the centuries' Leo of Vercelli had requested was put into effect immediately after the death of Gregory V. by the new pope Silvester II. (Gerbert of Aurillac) – one year late, however. Now it became necessary, to implement the new year-count reference efficiently and quiet (At least the Holy Father will have realized that a reform like this had the potential to escalate into an uncontrollable religious conflict). A visit within the lost and rediscovered tomb facing the upright sitting mummy of Charlemagne... – this may sound quite a bit overdone. But who could conceive the detail with the missing nose-tip? His 'Charles' would have been inevitably disqualified as a ruler (let's just recall the fate of Justinian II. 'Rhinometos' )! There are just two explanations: The nose of the death was indeed missing - In this case, Otto III. had found and opened the real grave of his forefather Càrolus Nazon (*480 †516 – 'Charly the Nose'). 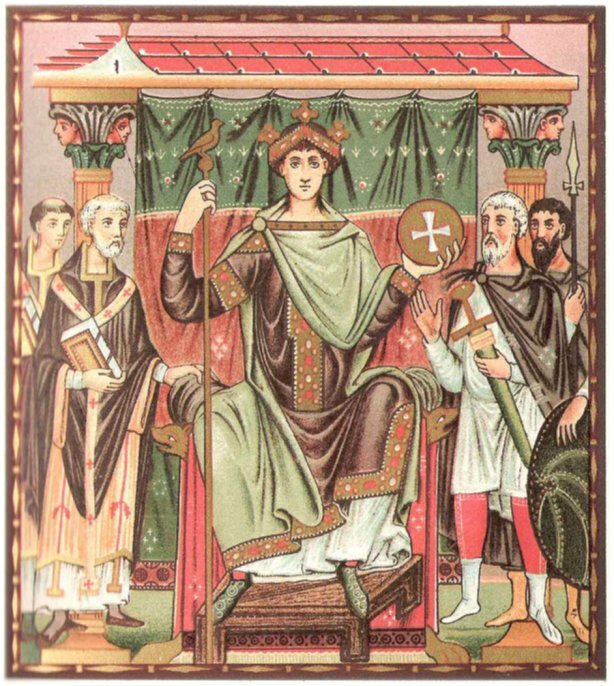 Alternatively, Otto new about the missing nose, possibly from records within his family – likewise an argument for the physical existence of Càrolus (Interesting to know: Although son of a king, Càrolus was the only possible candidate for the succession of king Clovis the Great who was not killed within the purge of 510 A.D.). 1. Austrapius, the last Charl (king) of the Menapian people - gave his title and his name. 2. Carolus Nazon - provided the corpse (nose), year of death (A.D.), ancestry. 3. Chlovis I. - did the conquest of the Francian empire. 5. Chlothar I. - subjected and christianized the Saxons. 6. Charles III. Simplex - used the KRLS-Signature and the coins assigned to 'Charlemagne'. 7. Otto I. - obtained the ointment as emperor by the Pope at Rome. Between Pippin the Old and Charlemagene some 128 years remained, where other regents must have ruled. The existing records named – just Pippin and Charles. So these names were repeated by chronologists to fill the non-existant gap. As the life-times of 'Charlemagne' and Clovis overlapped, Louis the Pious, his clone had to become the successor of Charles. However, the 2nd wives of Clovis and Ludwig had virtually identical biographies and family structure and died at Tours (separated by 299 virtual years).